The Akbar Khan-Max Page Master Teacher Award is another initiative supported by the M. Crist Fleming Endowment. This new TASIS tradition was launched in 2009, having been proposed by the TASIS Foundation and funded by the TASIS Board of Directors as part of their broader efforts to support and encourage the faculty as the heart of the TASIS experience and the center of our improvement in the coming years. Awarded annually, the Khan-Page TASIS Master Teacher Award is named after two outstanding teachers who taught for many years in both TASIS schools: the late Akbar Khan in mathematics and Max P. Page in English. 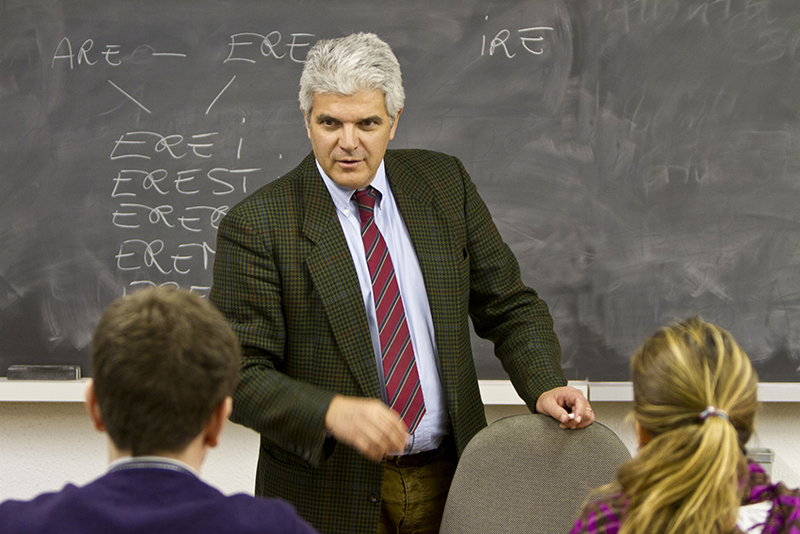 The award recognizes an outstanding teacher who represents a high standard of professional pedagogy, possesses advanced subject-area knowledge, has a capacity to convey the joy and importance of learning to students, and demonstrates a fundamental sympathy with the aims and goals of TASIS as expressed in the Paideia. The recipient receives CHF 5,000 to spend in any way he or she chooses. Candidates may teach in any grade level but must have taught at TASIS for at least five years. It’s now my great pleasure to start a new tradition at TASIS. This is one of dozens of ways that the TASIS Foundation and Board of Directors are striving to support and encourage the faculty as the heart of the TASIS experience and the center of our improvement in the coming years. To be given once a year, the Khan-Page TASIS Master Teacher Award is named after two outstanding teachers who taught for many years in both TASIS schools: the late Akbar Khan (in mathematics) and Max P. Page (in English). The award recognizes an outstanding teacher who represents a high standard of professional pedagogy, subject-area knowledge, a capacity to convey the joy and importance of learning to students, and fundamental sympathy with the aims and goals of TASIS as expressed in the Paideia. The recipient receives 5000 CHF from the TASIS Foundation’s M. Crist Fleming Endowment for International Understanding and Leadership, to spend in any way the recipient chooses. Each candidate must be a full-time teacher and may come from any grade level, PK-13, but must have taught at TASIS for at least five years. This teacher’s pedagogical power reaches outside the classroom to her colleagues as well. For more than a decade, she has labored intensely to improve the curriculum, train and unify her departmental colleagues, bolster our Summer Programs, expand the language homestay options for In-Pro trips, and design placement and achievement tests that help students move as quickly as possible to fluency. 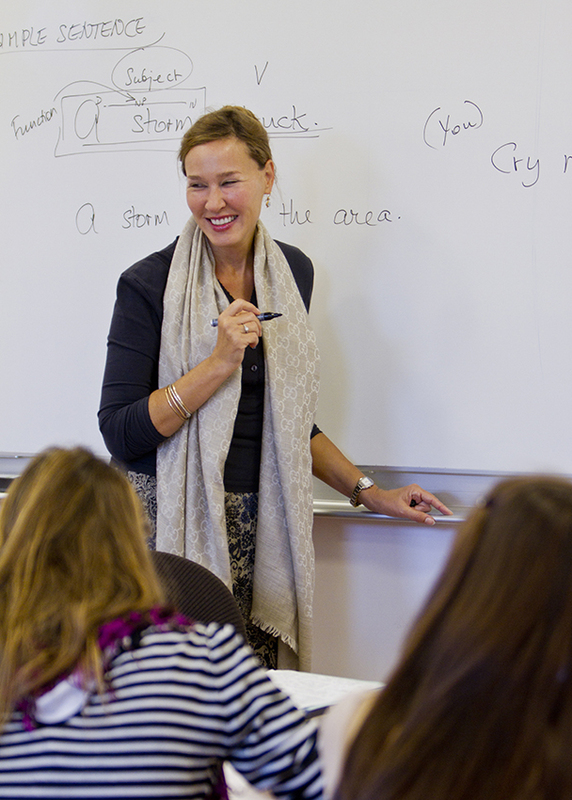 As a result, the English as an Additional Language department is one of TASIS’s most productive and important—a central reason why the 60% of our students who are non-native English speakers are transformed into 100% who leave TASIS prepared to succeed with university classes taught entirely in English. Tonight’s theme of passion fits our award winner well—for she loves languages and Shakespeare and opera passionately, enjoys the beauty of the written word passionately, cares passionately about the progress of her students, and—like Mrs. Fleming herself—believes that the daily labors of a teacher (whether diagramming sentences on the blackboard or grading essays through the weekend) can transform lives. With great pleasure I present the first Kahn-Page TASIS Master Teacher Award to Carolyn Heard. For two reasons, I’ve broken our conventional pattern of revealing the name of an award recipient after reading all the traits that qualified the person for the award. First, when you start to talk about an Art History teacher with nearly three decades of experience at TASIS, there can be little suspense. Second, I’d like us not to be distracted by guessing games and checking Mark’s face as I ramble through a long citation and he squirms to just get it over with, take the applause, and exit the limelight. So here are a few words about Mark, and why all of us can aspire to the kind of career he has enjoyed, and the kind of effect he has had on thousands of students. For a quarter of a century, in their Senior Exit Surveys, TASIS 12th Graders and PGs have pointed to Mark as an extraordinary teacher. "I've never met someone who knew as much about a topic and loved it as much as Mr. Aeschliman does," wrote one student a few years ago. Another commented: "I used to think that frescos and statues and paintings were just decoration for old buildings. Mr. Aeschliman’s Art History course taught me the stories behind the art and the meaning behind the stories. He changed the way I’ll see the world forever." Mark has taught a range of courses at TASIS: English to Studio Art, Italian to Architecture and Design. In recent years his energy has been focused on three of our Senior-Humanities-requirement options: the Art History survey, AP Art History, and IB Art History. He served as an AP reader for a decade. 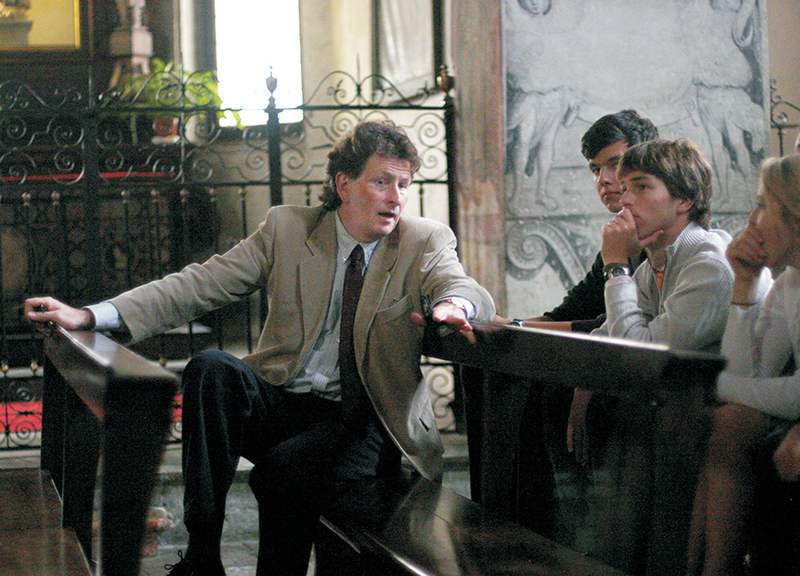 He piloted one of the world’s first IB Art History school-based syllabi. He has nearly completed an impressive text and workbook for Art History. He is a practicing artist who has exhibited his work in galleries from Berlin to the Malcantone. As our Master Teacher’s Department Head for six years, Laurence Koppe also knows Mark well. 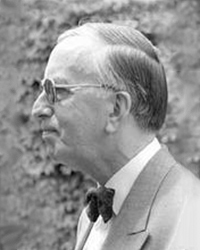 Listen to one one-hundredth of the praise that Laurence offered for his colleague. Because Mark’s mastery of the material is so expert, and his experience with students so extensive, he has the ability to perfectly calibrate presentations to the level of interest and sophistication of his audience." Mark is a star. As a colleague he is consummately professional, affable, diplomatic, expert, organized, and responsible. As a teacher he leaves students amazed and captivated. He awakens them to the wonder of Art, and informs them deeply about the power of its history. When I talk of my aspirations for TASIS to become the school of choice in Switzerland, I am not talking about mere SAT, AP, and IB scores or college admissions lists. I mean that I want people around the world to recognize that this is the place to enroll if you seek a life-changing experience for a student—the kind of campus on which truth, beauty, and goodness are so clear, so abundant, and so inescapable that children and adolescents cannot help but become better learners and better people. Mark Aeschliman has been igniting learners and changing lives here for 25 years. For his skill in the classroom, the depth of his knowledge, and the irrepressible passion for his subject, he is a most fitting recipient of this year’s Khan-Page Master Teacher Award. I am so pleased to present the Third Annual Khan-Page TASIS Master Teacher Award to Cynthia Whisenant. For a couple of reasons, I have strayed from our conventional pattern of waiting to reveal the name of an award recipient BEFORE reading all the traits that qualified the person for the award. First, if I talk about an English teacher with three decades of experience at TASIS, there can be little suspense. Second, I’d like us not to be distracted by guessing games and checking Cynthia’s face as I ramble through a long citation and she squirms and gives me signals to just get it over with so that she can accept the applause and exit the limelight. But Cynthia has been shining the limelight on students for a long time. Some just has to reflect back at her. So here are a few words about Cynthia—some reasons she won this award, and some reasons why all of us less-experienced TASIS teachers can aspire to the kind of career she has enjoyed, and the kind of effect she has had on thousands of students and hundreds of colleagues at TASIS. Cynthia Whisenant arrived in Montagnola nearly 40 years ago. In the years since, she has been a generous mentor, an inspirational teacher, and a quiet but potent community opinion leader. She is an icon of the TASIS Advanced Placement English course, but her contributions go far beyond senior English: teaching Middle School English, supporting students and families as a College Counselor, leading faculty conversations about curriculum and school culture, serving as an Advisor par excellence. “She has a wicked sense of humor,” writes Courtney Hawes, who succeeded Cynthia as Chair of the English Department, “and she is beloved by decades of students.” The reasons are clear: Cynthia loves texts, teaching, and teenagers—and that love is apparent to students from the moment they enter her classroom. Cynthia has a unique ability to tune into the moods, needs, and aspirations of adolescents. The individual attention she gives each student is remarkable. Every semester, she accommodates for different learning styles and sets individual objectives that stretch every learner. 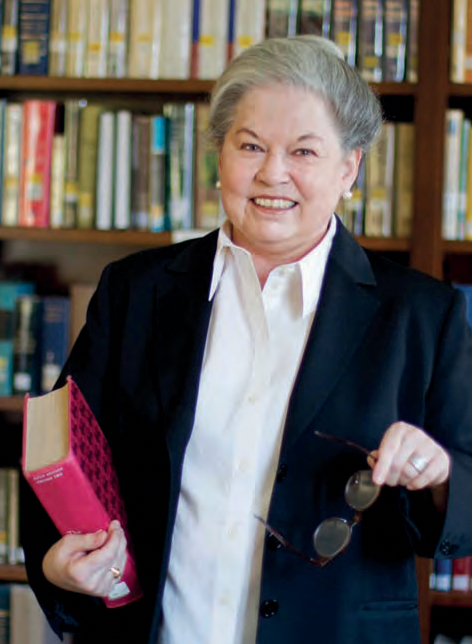 She is a master of the craft of teaching writing and literary analysis. Mark is not alone in prizing Cynthia’s friendship. Several colleagues pointed first to her compassion and integrity, and then to her qualities as a teacher. Deeply caring, fair, loyal, and a good listener—she has provided company, counsel, and colleagueship to dozens of teachers on this sometimes lonely linguistic island of TASIS. Bill Eichner travels around the world, meeting alumni and probing their memories for what stuck and what mattered from their TASIS experience. It’s not surprising that Cynthia’s name comes up so often in those conversations, for indeed those students who, as she put it, “belong to her” are now scattered all over the globe. And so, having provided enough embarrassment to Cynthia to last all summer, it gives me great pleasure to present the Khan-Page TASIS Master Teacher Award to a colleague who has provided guidance and reassurance, wisdom and inspiration to so many in our community: congratulations to Cynthia Whisenant. 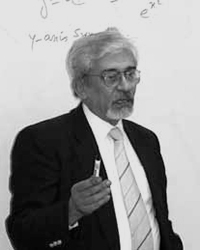 The Khan-Page Master Teacher Award is given annually to an outstanding TASIS teacher who represents a high standard of professional pedagogy, subject-area knowledge, a capacity to convey the joy and importance of learning to students, and fundamental sympathy with the aims and goals of TASIS as expressed in the Paideia. After studying music in Spain and France, Brigitte earned a Bachelor of Music from the New England Conservatory in Boston. She went on to do pedagogical work at the American College in Paris, earn a diploma from the Academie Internationale de Nice, and a Master’s in Second Language Acquisition from Cambridge University. 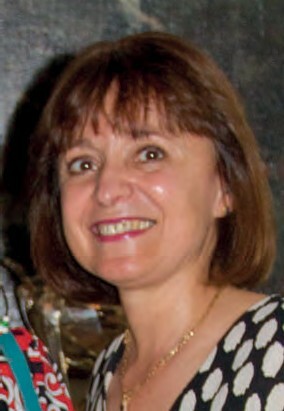 Brigitte arrived at TASIS in 1993, and has served as a Dorm Parent and jogging coach, and taught French language and literature at all levels, including AP and IB. For nearly two decades, her students have said she is tough but fair—many identify her as the most demanding teacher they’ve ever known, and the best teacher they’ve ever seen. Academic Dean John Nelson sees that same tough love in Brigitte. He writes, "We should not be fooled by Brigitte’s diminutive stature or quiet voice. She is a Frankish warrior of old, on a crusade to instill a love and fascination of the French language and literature. Our own Joan of TASIS. The language and legacies of Molière, Baudelaire, and Proust deserve devotion and fidelity. She drives her students hard, and herself harder. She loves the classroom and sharing her love of French with all students." Also remarkable is Brigitte’s generous approach to extra help. Despite teaching five classes at TASIS and another at Franklin College, she is in the regular habit of offering many hours per week of unpaid tutoring to her students. Here are the words of one grateful parent: "I’ve never seen another teacher in any of the schools my daughters have attended who has this type of determination. She follows her students very closely and at the slightest sign of difficulty she reacts. There was a period when she would call me, up to twice a week, to discuss the fact that my daughter was having trouble with her written French. She told me exactly what I could do and what my daughter should do in order to improve. I think that she feels an extraordinary sense of duty to have the student really learn the material." Fellow Master Teacher Cynthia Whisenant concurs. "Brigitte is a bright, determined, dedicated, and highly successful teacher who does what she does because she believes in and enjoys teaching. She expects excellent work, and she is able to point the way to students achieving excellence if they choose to do so. Brigitte is a supportive, honest, and forthright colleague who wishes for all of us to succeed in what we do. She has been an ideal colleague as well as friend." I am so pleased to present the Fifth Annual Khan-Page TASIS Master Teacher Award to Giorgio Volpi. Every year with this award I have reversed our conventional pattern of waiting to say the name until after a long citation. Why? Well, first, if I talk about an Elementary School PE teacher, we are left with very little suspense. Second, I’d like us not to be distracted by guessing games and looking around the room as I ramble through a long citation. Part of this annual ritual is tuning in with full attention to the kinds of things that make for a career of excellence at TASIS and more broadly in this noble profession. So...listen up. I doubt that anyone on this terrace teaches more students, or more varied students, than Giorgio does. All day long, he teaches 185 TASIS elementary schoolers, ages 4 through 11. On afternoons, evenings, and weekends, he coaches high schoolers and young adults on his American football team. One might think that teaching PE is just a matter of tossing out the balls and watching the children play. Anyone who has watched Giorgio teach knows otherwise. He has a full set of detailed lesson plans for each grade, derived from clear objectives for health and skill development. He was doing this all along, long before Atlas Rubicon. As a teacher, he is always firm and always affable. Kids love his humor and playfulness, but it never disintegrates into idle, random play or babysitting. His lessons are always full and meaningful, from the first to the last minute of the period. Giorgio is among the world’s most flexible and patient human beings. His classrooms are often stolen for assemblies, exams, concerts, galas, and exhibitions. His subject is always the last to be scheduled, and he often seems to get the short end of the stick. Somehow, without whining or complaining, he manages. Ask any Elementary School student who their favorite teacher is and they will say Mr. Volpi. They love his class and cannot wait to get there. When they arrive they come bursting into the gym, sit in their assigned spot (their casa) and tremble with excitement waiting to see who will get to carry the rubber chicken to lead the warm up. 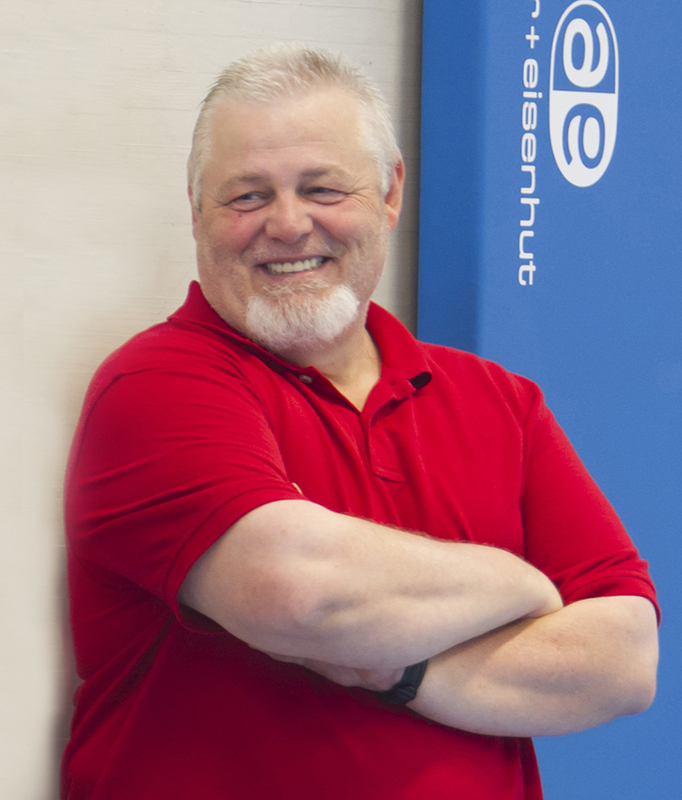 He teaches a unique blend of movement education and Swiss physical education. I don’t think you will find it anyplace else. When students arrive to our Middle School from his PE program they know their sport skills. They are fit, agile, can balance, are flexible, are strong and healthy, love moving, and have learned how to behave in a PE class. When the seniors graduate they pile thanks on their teachers, dorm parents, advisors, their dean, a coach, the headmaster... usually someone from their recent experiences who helped them with some monumental senior task. They never thank the guy that started them out on the right path. They have forgotten that once they could not shoot a basket, hit a ball, move with confidence, feel certain when challenged, work in a group, dance...they forget that Mr. Volpi got them started and helped shape them into the person they are in that senior year. They may have outgrown him, but a part of him is there with them as they cross the finish line. Giorgio, Tom is not alone in celebrating our choice for this award. Thank you for being the person you are and for sharing that person so generously with your students and your colleagues. Congratulations, Giorgio! Brett Merritt is meticulously organized, very thoughtful, and student-centered. He builds lessons that leave his students wanting more. He finds genuine ways to engage every student in his class. 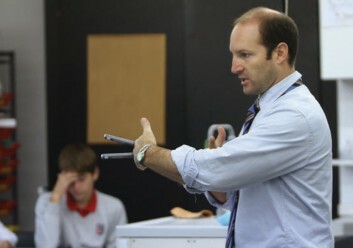 For him it is about each student’s individual growth and understanding, rather than the completion of a unit or course. His ability to differentiate coupled with his genuine interest in engaging the whole child has made him a favorite amongst middle school students over the years. For Brett it’s about getting his students thinking, debating, and daydreaming about science. He has fostered a department where students are future designers and engineers, all eagerly showing off their inventions and creations to other students. In terms of success as a teacher, I don’t know what more you could ask for. Brett’s scientific mind is always at play in the various meetings and committees he serves on at TASIS. He spends the first chunk of time quietly observing, then, in the last 15 minutes of the meeting, Brett will usually come up with the perfect idea that suits all points of view. He is a dynamic team player because he is always able to consider what is best for students and the School at large, rather than just aligning with the belief that most closely mirrors his own. When I think of a master teacher, images of smiling and hardworking students, much laughter matched with much learning in a classroom or on the sidewalk, occasionally a tear or two, and passion for our calling—those are the images that come to my mind. Plus a new one; my image of a master teacher now includes serenading students, and in my mind’s eye I will always see Mario at the Senior Prom bringing the house down. As legions of students, including faculty members, will attest, Mario’s love of teaching and the Italian language is manifest in all he does, and it serves to both inspire and motivate them in their studies. He is a Renaissance man whose musical talents, athletic interests, and commitment to family and TASIS flow together in a life being well led. One of my personal measures of a teacher is his or her response to addressing a challenging student. A master teacher, to my mind, is a person whose repertoire of teaching tools to reach a student, any student, is matched with a passionate commitment to reach that challenging child and help her grow. Mario is such a teacher, and demonstrates that range and belief in his students daily. Patience, enthusiasm, solid preparation, and great results—a fitting description of my friend Mario d’Azzo, this year’s Khan-Page Master Teacher. Amy has been at TASIS for six years. She teaches both sixth grade science and IB Biology. In both courses she finds ways to excite her students. Amy truly is student centered. Her students are always at the forefront of her mind, when thinking about her lessons. Amy is an avid learner who constantly is looking for ways to further develop her craft. From IB conferences, to robotics, to coding, she is constantly learning and stretching herself. 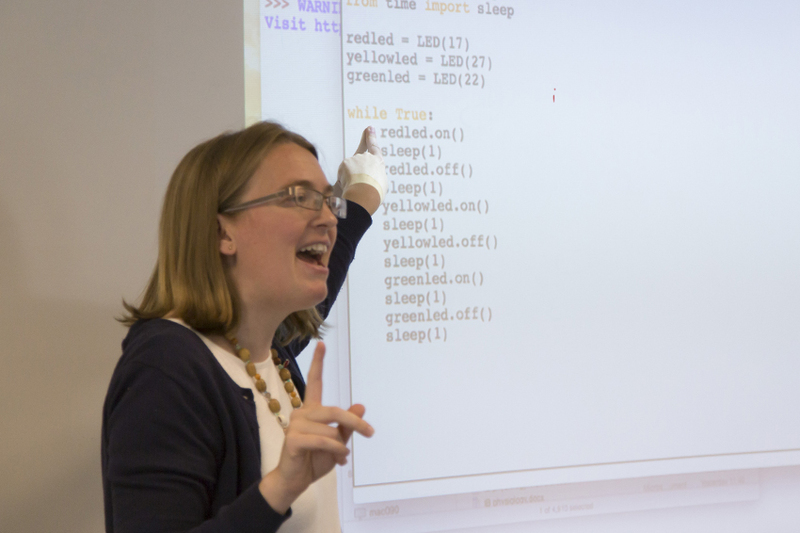 This past February Amy was one of a small handful of teachers from around the world who were selected out of a pool of thousands of applicants to take part in Piacademy. What nudges Amy’s excellence toward something we might call “mastery,” is that she consistently and effectively approaches the art and practice of teaching science critically. Amy thinks about the education of science students in relation to basic values and not just in relation to matters of fact and explanatory adequacy. Amy not only routinely questions whether something in her profession is so, but she also asks how science education functions to make the world a better or worse place, a more or less just place. Amy thinks not just about scientific content, but also about why science is studied in the first place. Amy, in her daily thoughts, speech, and other actions, consistently demonstrates a deep understanding of her students, her subject, and her craft. It is a great honor to recognize Amy today. This year’s Kahn-Page Master Teacher Award winner is a humble person who would never boast or comment on the extensive amounts of work he does for the TASIS community. He is motivated not by recognition. He is motivated by his genuine passion for teaching and love of children. This year’s recipient embodies the Mission and Vision of TASIS. Committed to academic excellence, he spends an enormous amount of time and energy in tailoring his preparation to each class to ensure his students have the best chance of retaining the information. His students look forward to their time with him, both inside and outside the classroom. The students appreciate him, and the feedback from parents has always been very positive. He is a dedicated and caring teacher and dorm parent. TASIS expects its teachers and administrators to assume in loco parentis responsibility for students, and our recipient is sensitive to the needs of his students along with being empathetic and compassionate. He truly wants his students to succeed academically and socially, and this is reflected in his teaching and interactions with both his present and former students. He is an educator in all aspects of the word. He takes his responsibilities seriously and ensures he gives his all to every role he plays at TASIS. As a dorm parent, he is an excellent role model for our students. Even when taking students on weekend climbing or skiing trips, he also uses this time for teachable moments to help our students learn to be better people and learn new skills. His impressive style of preparing his advisees for Academic Travel ensures they face their destinations with knowledge of the places we visit and confidence in their ability to travel abroad without their parents. TASIS recognizes the importance of teaching fitness and healthy habits of living. Our recipient encourages students to participate in a wide range of outdoor and physical activities, leading clubs and activities that challenge and stretch students physically and emotionally. On top of everything else, our recipient is a wonderful colleague. He is flexible, collaborative, and positive—three traits that reflect his commitment to education and to boarding school life. It is my honor to announce the 2018 Khan-Page Master Teacher Award winner, Patrick Alava.